I am passionate about helping people to create a better future. My practice is in the design of group processes that support dialogue – where groups of people can think-together and where conversations deepen. I am fuelled by the belief that stronger relationships are the foundation for the types of collaboration needed to progress our most complex challenges. Read examples of my work here. Read about my collaboration with rustybrown partners here. Link to my Bio here. Most of the big challenges facing organisations and communities are complex and interconnected – in response we need to work and play together more effectively. I have a reputation for supporting diverse groups of stakeholders to progress their most complex challenges. 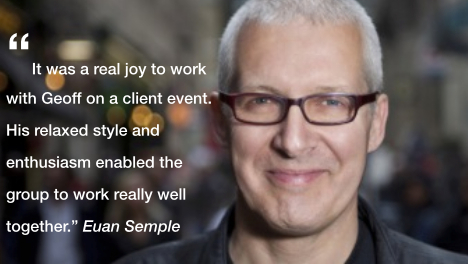 With clients I help to co-design processes for individual events and whole programs of work that evolve over time. I work within and across multiple sectors including sustainability, population health, integrated water management, energy systems, food security and natural resource management. I work with individuals, community groups and organisations from the public, private and community-based sectors.